Since our launch of ProfitWell Retain, we've been involved in sending millions of messages that have recovered millions of dollars in delinquent recurring revenue for our customers. With all of that testing and messaging came a lot of learning. We've learned what works and what doesn't for delinquent churn messages, and how to maximize their impact to minimize the impact of involuntary churn on your business. Here are a few things we've found that can make sure you aren't missing out on revenue. One common tactic discussed is that you should be sending what are known as pre-dunning emails. Dunning is a jargony word for contacting someone for updated payment information, and pre-dunning emails are those that reach out to a customer who has an expired card to let them know that they need to update their credit card. In theory, pre-dunning emails sound like a great idea, but in reality all data indicates that you should not send pre-dunning emails, because you end up inviting more churn than you're actually solving. There are a variety of factors that contribute to this increased churn, but it typically breaks downt to the fact that the quality of pre-dunning emails are so low that they end up annoying your users more than helping them understand the continued value in your product. 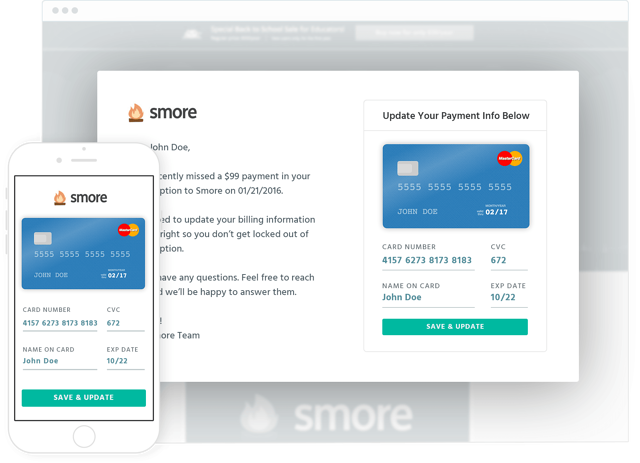 Plus, a good group of these folks are already going to come back through automatic retries or auto-updaters built into your payment processor. What's a better alternative? You should be doing pre-dunning, but it needs to be strictly in-app. Remember, "dunning” means to pester someone for payment. That is one of the reasons we try to avoid the term. Delinquent churn emails need to be personal, not pestering. Though they might seem perfunctory, our marketing model requires us to put the same level of effort into these as we would any other drip campaign. Personalize yourself. Yes, you are going to add “Hello [first name]” into your email. But with these emails it's the inverse personalization you need. You need to personalize yourself. This is for the exact reason above—people don't want to get emails demanding money with menaces. If your email comes from billing@ or noreply@ then you aren't treating your customers as people. Have emails sent from members of your team so that the human connection remains and so customers can reply if they need to know more. Get to the point. These don't have to be detailed emails. 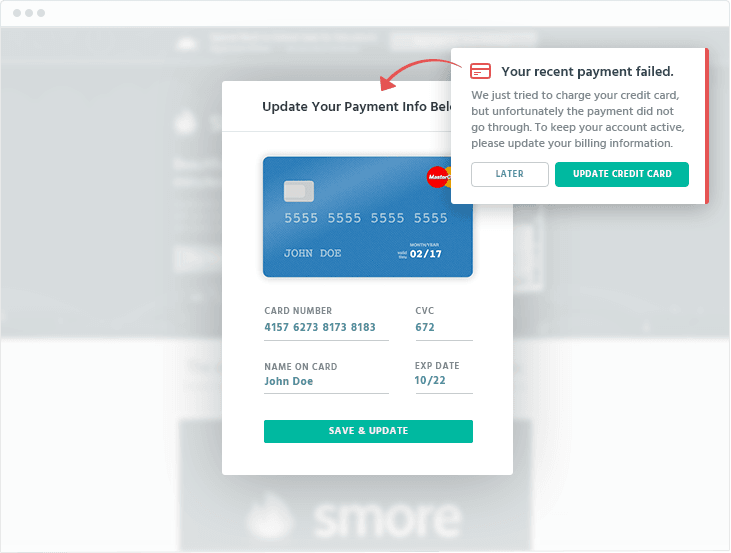 While some (see below) might benefit from extra information, delinquent churn emails are about pointing customers towards one thing: the billing information page. Don't use these emails for anything apart from moving them closer to giving you the fresh credit card information. Be valuable: The email has to give the customer directions to solve the problem. You can't tell them there is a problem and then tell them to go and update. Give them the link to their direct billing update page and tell them exactly what needs to be done—new number, new expiry date, new address, whatever. Make it as plain and simple and seamless as possible to get it done. These are all identical lessons to a marketing campaign. Treat your customers as people and be confident in your product. These involuntary churners want to stay. All these delinquent emails do is make that easier for them. This is a drip campaign just like any other. If a customer is coming up on the expiration date of their credit card, then they probably won't respond to the first email, just as leads don't respond to the first email. They are nurtured towards acquisition, and delinquent customers can be nurtured towards updating. Your first pre-delinquent emails should be quick and to the point. Tell them what the problem is and how to fix it. Subsequent pre-delinquent emails should reiterate the value of your product and what they will miss out on if they involuntarily churn. Your first post-delinquent emails should then start to show that they'll lose data/access if they don't update before the next billing cycle. Your final post-delinquent email should tell them bluntly that they are about to lose access unless they take action. As you ratchet up the urgency, you still have to keep the concepts above in mind. The final email, when you are just about to lose a great customer to something as stupid as a credit card expiration, has to be as personal, pertinent, and valuable as all the others—it may be that one they finally read. Emails are ignored, archived, or spammed. That's why you need to think in terms of a delinquency churn campaign rather than a single email. For billing information updates, they have another issue—they aren't where the problem is. If someone is checking their email, then they aren't in your product, which is where they need to be. The number one lesson from ProfitWell Retain is that while email works, there is a better way to get people's attention—in-app notifications. We learned that in-app notifications are far more likely to decrease your rate of delinquent churn. The user is already in the app so display a pop-up with a quick one-minute detour to the account page and they are all done. Additionally, it gets them when they are experiencing all the value that you talk about in your emails. No matter how many words you write, it can never beat the experience of using the product and feeling that value first-hand. They are there and want to use the app. It is the prime point at which they are willing to pay. Use that positive feeling to nudge them towards the update landing page. 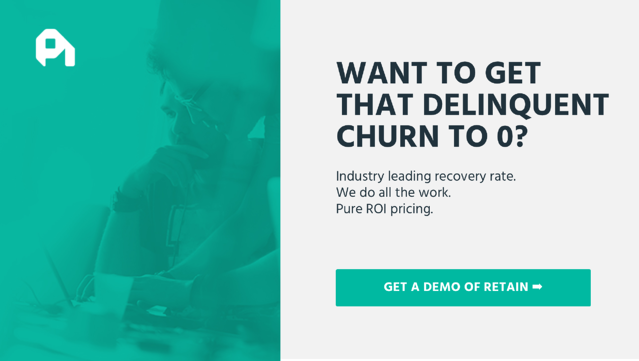 Delinquent churn is a simple problem with a simple solution—communication with your customers. Yet we know that too many people miss out on revenue because they don't have a system in place to fight this involuntary churn. But they nearly always have a comparable system in place—their marketing campaign. The lessons we've learned from sending 1.4 million delinquent churn messages are the same that we've learned from sending thousands of marketing emails—show your customer value, and they will pay for it. By taking these lessons and communicating effectively with your customers, you can show them the value of staying with you while guiding them towards signing up their fresh new credit card. Then, with a few simple emails and notifications, you've saved your company thousands in recurring revenue and kept happy customers in your product for years to come. Have any questions? Feel free to reach me at patrick@priceintelligently.com.